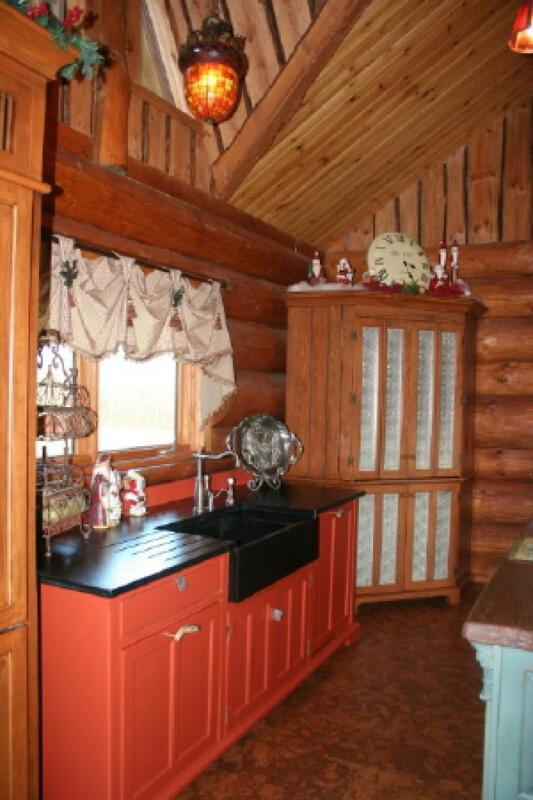 A Log home is a perfect fit for furnishing a kitchen instead of installing upper and lower cabinets because the logs are exposed between each piece, preserving the character of the room. Also, since logs tend to shrink, flexible anchors can be used with furniture, making installation so much easier. A typical log home that has a normal kitchen installed with long lines of cabinetry and exposed appliances will first install drywall on a stud wall that allows the log structure to shrink without affecting the cabinets. This of course eliminates the logs from view, so using furniture is a natural way to preserve the rustic beauty and integrity of the structure in a log home. 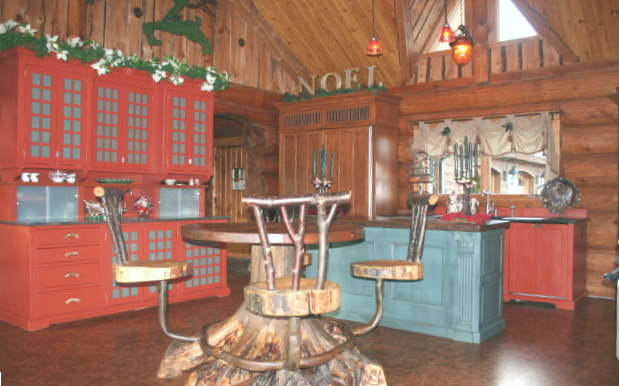 It’s Christmas in this new log home that features four unfitted YesterTec Workstations. The Oxblood painted (S2) sink workstation conceals an integrated dishwasher and features a soapstone apron front sink and grooved countertop. It is flanked to the right with a Working Pantry that features a concealed working countertop to store (and use) all of the small appliances and includes abundant storage for food, cookware and dishes. Its custom punched tin door panels mimic the color of the exposed, stainless steel commercial range (not shown). 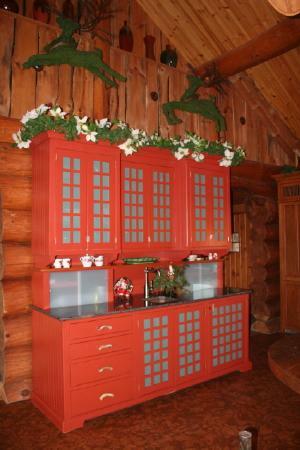 To the left of the sink (and barely seen behind the custom made breakfast table) is a Subzero Refrigerator Armoire in distressed pine to compliment its rustic setting. The center island was from the owner’s previous kitchen, but complements the workstations that were ordered from YesterTec. The above image is a freestanding wet bar/storage breakfront that features our grid doors that are painted the same color as the island. This piece is built by combining a sink base (S2) with a (ST2) storage piece with frosted sliding doors and a (TP2) top storage unit above. The enormous storage capacity of this unit, combined with the corner cupboard eliminates the need for any of the typical top cabinets found in standard kitchen.